Two great charities that Zuma Office Supply proudly supports are The Salvation Army and the Capital Area Food Bank. Both organizations Do Good Work helping those in need during normal times, and in times of disaster. The central Texas wildfires came fast and without warning, affecting thousands of families and leaving many homeless and struggling to take care of life’s basic needs. Many central Texan’s are very grateful to the helping hands of The Salvation Army, the CAFB, and those who support their efforts through charitable donations. 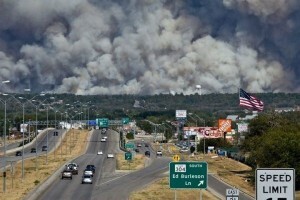 This ominoius view of the Central Texas wildfires from Austin, TX looking out towards Bastrop county. The Salvation Army responded immediately to the wildfires which spread across much of Central Texas in early September, meeting the needs of survivors and first responders by providing food, beverages, emotional/spiritual care, and other necessities. The statistics below are a snapshot of ongoing Salvation Army Emergency Disaster Service efforts in Texas. The Capital Area Food Bank has fed thousands of people in need who were left hungry, and feeling helpless from the wildfire disaster. Their Mobile Food Pantry unit continues to spend many hours in the Bastrop county area delivering free food to all those who need it. Do Good Work and help Zuma support the Capital Area Food Bank! Zuma encourages you to help with ongoing efforts by donating to these great organizations today. Just $1 donated to the CAFB generates $5 of nutritious food for hungry families in need. For more information on The Salvation Army and their relief efforts, please visit www.disaster.salvationarmyusa.org. Zuma Office Supply sells office supplies to do our best to support the work of these wonderful charities, and we encourage you to consider doing what you can do to help too. It’s what we’re all here for….helping others. Do Good Work with Zuma, The Salvation Army and the CAFB! This entry was posted in Charities and tagged Capital Area Food Bank, Do Good Work, office supplies, Texas wildfires, The Salvation Army, Zuma. Bookmark the permalink. There was a soldier of the Salvation Army a sergeant I think just standing by his little red kettle smiling and waving.